U.S. Gemstones: A diversity of gemstones are produced from mines throughout the United States. Top row: malachite and azurite cabochon (Arizona), a rough ruby (North Carolina), a faceted orange sunstone (Oregon), a teardrop variscite cabochon (Utah). Second row: a Vesuvianite cabochon (California), a freshwater cultured pearl (Tennessee), a cabochon of Montana Moss Agate (Montana), a handful of diamonds (Arkansas). Third row: two pieces of aquamarine rough (Colorado), an opal cabochon (Idaho), a faceted bicolor tourmaline (Maine), a faceted fire opal (Nevada). Scroll down to read more about these gems and others. A surprising diversity of gemstones are produced within the United States. Did you know that Montana is the home of world-famous sapphire localities, and that emeralds, rubies, and sapphires are all found in North Carolina? Have you ever seen an "Oregon sunstone" that flashes with a copper aventurescence, or a cultured freshwater pearl with a golden luster produced in Tennessee? These are just a few of the unique gemstones produced in the United States. Gemstones Produced in the U.S. The United States Geological Survey reports that notable quantities of gem-quality agate, beryl, coral, diamond, garnet, feldspar, jade, jasper, opal, quartz, ruby, sapphire, shell, pearls, peridot, topaz, tourmaline, turquoise, and other gem materials are currently produced in the United States. Thirteen states produce almost all of the natural gemstones mined in the United States. They are listed below. Did You Know? If you attend the Tucson Gem and Mineral Show (held every February), you can purchase rough or cut stones from most of the important gemstone mines in the United States - and often purchase directly from the person who did the mining. Don't be afraid to ask - they usually enjoy telling you all about their operation. Sometimes the same person mines, cuts, and markets the stones! Although the United States produces a diversity of gemstone varieties, the quantity produced is very small. In calendar year 2017 the total gemstone production of the United States was only $13 million. That amount is very very small compared to the $22.6 billion in gemstones that were imported for consumption. The United States has greater than a 99.9 percent dependence on foreign gemstone supplies. Most of the gemstone production in the United States comes from very small mines with just two or three employees who are often part-time or seasonal workers. Very few of the mines have more than a dozen employees and operate during all four seasons of the year. In 2014 about 250 gemstone mines were operating in the United States. They employed between 1,200 and 1,500 people. A significant amount of additional gemstone mining in the United States is done by rockhounds (amateurs who search for rocks, minerals, gemstones, and fossils as a hobby). Many of them do their rockhounding on public land (areas owned by the government where individuals can collect if they observe the rules). Others go to fee mining sites. These are proven gemstone deposits where visitors can pay a fee, look for gemstones, and keep any that they find. Macrocrystalline quartz includes: amethyst, aventurine, blue quartz, citrine, hawk's eye, quartz, cat's eye, rock crystal, rose quartz, smoky quartz, and tiger's-eye. Cryptocrystalline quartz includes: agate, carnelian, chalcedony, chrysoprase, fossilized wood, heliotrope, jasper, moss agate, onyx, and sard. ND: Value not disclosed because it would reveal proprietary information of a small number of producers. Data from USGS Minerals Yearbooks. Why Is Production So Low? Gemstone production in the United States is surprisingly low considering the large geographic area of the country and the large number of people who have a strong interest in finding gemstones. Three barriers stand between an interest in mining and the successful operation of a mine: 1) the cost of opening a mine; 2) the cost of labor; and, 3) government regulations related to environment and labor. The cost of opening a mine in the United States is extremely high. Before mining can begin, a permit must be obtained. The permit is required to assure that the mine will be developed and operated with minimal impact on the environment, minimal hazard to employees, and in compliance with all local, state and federal laws. The research, data collection, planning, and writing that must be done to complete a permit application is enormous. This cost cannot be supported by the small-size deposits that are typical of most colored stone mining. The cost of labor in the United States is very high in comparison with the cost of labor in other countries. People need to earn a decent wage as in any other industry. Much of the colored stone mining done in other parts of the world is supported by very low cost labor. There are also many costs associated with operating a mine in compliance with government regulations. A significant investment must be made in safety planning, equipment, and procedures. A significant investment must also be made to control wastewater, erosion, dust, and many other problems associated with operating a mine. These can easily total more than the value of the gemstones that would be produced from a small colored stone deposit. Many people really enjoy gemstones produced from domestic deposits. Some mineral collectors favor certain localities, and some gemstone buyers (especially tourists) have a strong desire to purchase a "Montana Sapphire" or an "Oregon Sunstone" when they visit those states. This patronage strongly supports the price of stones from certain localities - far above the price of similar-size, similar-quality stones from anywhere else in the world. This patronage also supports a small domestic lapidary industry. Many people who visit Arizona want to bring home a piece of petrified wood, and many people who visit upstate New York want to find a "Herkimer Diamond." There is even one location in Arkansas, Crater of Diamonds, where anyone can become a diamond miner by paying a small fee. These are fun activities, many people enjoy them, and they support the small gemstone industry of the United States. In 2011, the state of Arizona led the United States in the production of gemstones. Arizona has long been famous as a producer of turquoise, peridot, and petrified wood. Gemstones such as azurite, chrysocolla, and malachite are associated with Arizona's many copper deposits and have a long history of being produced there. Agate, amethyst, garnet, jade, jasper, obsidian, onyx, and opal have all been found in Arizona and used to make gems. The photo here shows several cabochons cut from Arizona copper minerals. 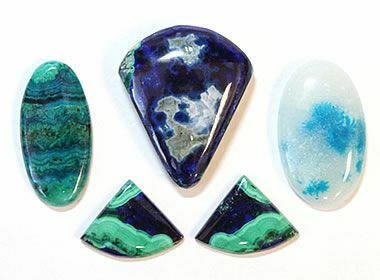 They are an oval of chrysocolla and malachite on the left; three triangular cabs of azurite and malachite in the center; and on the right, a quartz cabochon with chrysocolla inclusions. All materials were found in the Morenci area, a famous copper locality. Learn more about Arizona Gemstones. 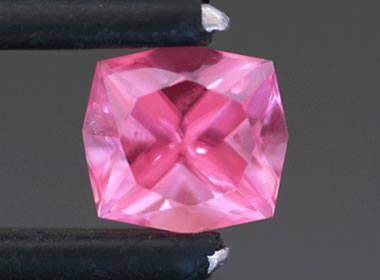 Most people are surprised to hear that rubies, sapphires, and emeralds can be found in North Carolina. Although the area does not support a large gemstone mining and cutting industry, there are many pay-to-prospect mines where anyone can enter, pay a small fee, and keep all of the gemstones that are found. Some local businesses have skilled gem cutters and bench jewelers who can turn a nice piece of rough that you find into a beautiful piece of jewelry. Gem materials found in North Carolina include aquamarine, beryl, citrine, emerald, garnet, moonstone, rose quartz, ruby, sapphire, smoky quartz, staurolite, topaz, and tourmaline. There are even a few places where you can find gold. The North Carolina rubies in the photograph at right were captured by Peter Cristofono. Learn more about North Carolina Gemstones. Oregon produces some of the best gem-quality feldspars in the world. Several small mining operations have become world-famous for producing "Oregon Sunstone," a transparent feldspar that is loaded with tiny copper platelets aligned in a common orientation. When a sunstone is tilted in the light, at just the right angle, these platelets simultaneously reflect a flash of light. Oregon produces several other gem materials including the famous "thunderegg," a type of geode that is ugly on the outside but often filled with beautiful chalcedony, opal, or crystals inside. Some people argue that thundereggs are more popular than sunstone! Oregon also produces a number of different fire opals and common opals with beautiful colors. There are several pay-to-dig sites in Oregon where you can find sunstone, opal, thundereggs and more. Learn more about Oregon Gemstones. California is widely known for its tourmaline and turquoise production. Native Americans were the first to treasure these minerals, and a commercial gemstone industry was active by the late 1800s. The tourmaline deposits of Riverside and San Diego Counties have supplied more tourmaline for cutting and mineral specimens than any other tourmaline deposits in the northern hemisphere. California gemstones also include many varieties of agate, jasper, jade, garnet, and quartz. The state is one of the only sources of benitoite, a blue barium titanium silicate, and it has been named the state gemstone. 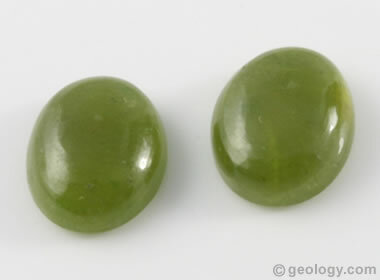 The image at right is a Vesuvianite cabochon cut from material produced at the Happy Camp mine in Siskiyou County. Learn more about California Gemstones. Utah produces a wide variety of gemstones. Although topaz is Utah's state gemstone, the gemstone that is getting a lot of recent attention is red beryl, also known as bixbite. The faceted red beryl shown here from the Wah Wah Mountains is a beautiful example (photo by Bradley Payne of TheGemTrader.com). Amethyst, garnet, jasper, agate, and opals are also found at numerous locations in the state. Utah also has the world's only locality where beautiful purple Tiffany Stone can be found. Learn more about Utah Gemstones. Tennessee is well-known for a single gem material - pearls. 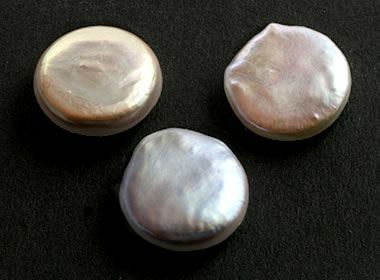 The American Pearl Company operates the only freshwater pearl farm in the United States. They produce cultured freshwater pearls from native river mussels. The coin-shaped pearls in the photo are from the American Pearl Company and display iridescent shades of golden, pink, and blue. Learn more about Tennessee gemstones. Montana's most popular gemstone product is sapphire. Yogo Gulch sapphires have been famous for over 100 years, and the production of sapphires in Montana continues today. 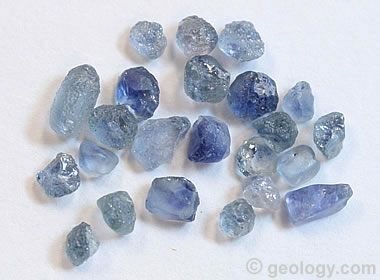 Sapphires are produced from both rock and alluvial deposits. They occur in a wide range of colors which include blue, blue-green, green, pink, pale red, purple, yellow, and orange (colors often produced by heat treatment). 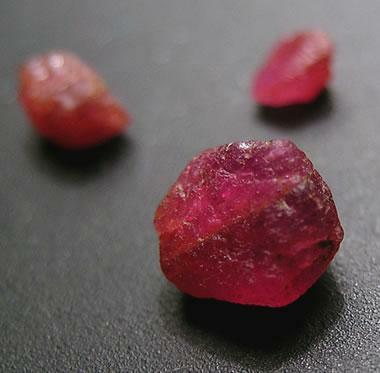 Some gem-grade garnets are also produced from the alluvial deposits. Rockhounds in many parts of Montana enjoy looking for agate and jasper. One of the most popular is "Montana Moss Agate," a transparent to translucent material that usually has brown to black bands or "moss" in a wide variety of patterns. Learn more about Montana gemstones. Many different gemstones are produced in Colorado. These include aquamarine, amazonite, garnet, topaz, tourmaline, lapis lazuli, quartz, smoky quartz, rhodochrosite, rose quartz, amethyst, turquoise, peridot, sapphire, zircon, agate, and jasper. A rough diamond from Colorado was cut into a 16.87-carat stone. It is the largest cut diamond ever produced from United States rough. Aquamarine is the state gemstone of Colorado, and it is mostly found at high elevations on Antero Mountain. Rhodochrosite is the state mineral, and many specimens are cut into gemstones such as the stone shown here from the Sweet Home Mine. Photo by Bradley Payne, TheGemTrader.com. Learn more about Colorado Gemstones. The most popular gemstone locality in Arkansas is Crater of Diamonds State Park, where anyone can pay a fee, look for diamonds, and keep any that are found. The site is an operating state park, and visitors usually find hundreds of small diamonds every year. There are several other fee mining areas in the state where you can pay a fee, look for minerals and keep what you find. Arkansas's most important gem material is quartz. In Arkansas, clear quartz is often called "rock crystal." 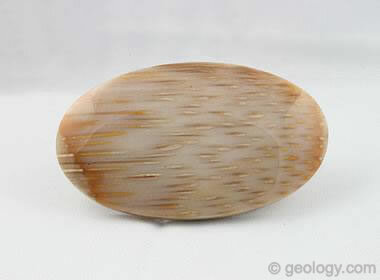 It is produced and sold as specimens and also used for faceted stones, beads, carvings, spheres and decorative items. Exceptional specimens of rock crystal can sell for thousands of dollars. Clear, undamaged single crystals are made into pendants, earrings and other types of jewelry. In addition to rock crystal, Arkansas produces other quartz gems including agate, chert, jasper, opal, petrified wood, and smoky quartz (frequently heat-treated rock crystal). Learn more about Arkansas Gemstones. Idaho's nickname is "The Gem State." It has a long history of producing a variety of gem materials. The most important gems produced to date have been star garnet and opal. Notable amounts of jade, topaz, zircon, and tourmaline have also been found in Idaho. Agate, jasper, and petrified wood in many colors and patterns have been found and produced from small deposits throughout the state. Learn more about Idaho Gemstones. The first commercial gemstone mine in the United States that was operated by miners who were not Native Americans was at Mount Mica, Maine. 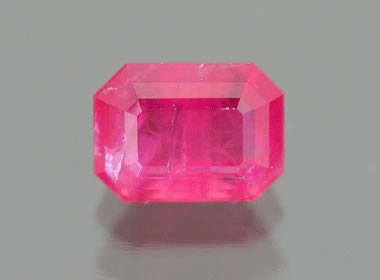 There a large deposit of tourmaline was discovered by children in 1820. Two years later a mine was opened and it yielded thousands of carats of gem-quality tourmaline crystals. Since then the pegmatite deposits of western Maine have produced many varieties of tourmaline, aquamarine, morganite, smoky quartz, rose quartz, and amethyst. The three stones in the photo are very nice tourmalines from the Dunton Quarry, located in Oxford County. Photo by Thuss Photography, used with permission of the Maine State Museum. Learn more about Maine Gemstones. Most people would not think of Louisiana as a "gemstone state." However, it is the source of a unique variety of precious opal and a source for abundant amounts of "petrified palm wood." The palm material found in the Catahoula Formation, a sedimentary rock unit deposited during Oligocene time, is so popular and well-known that the state legislature named it the official "state fossil." Learn more about Louisiana Gemstones. A variety of gemstones have been found in Nevada, and the state is well-known for its opal. After Australia, some of the finest black opals in the world come from Virgin Valley, Nevada. The specimen shown here is a 9-millimeter faceted yellow fire opal of about 1.79 carats, cut from rough produced in Nevada. The state is also well-known for its turquoise, petrified wood, agate, jasper, and obsidian. Learn more about Nevada Gemstones.